Halloween is nigh. Once an American sensation, the call of the spook has most certainly reached us across the pond. These days, you’ll see almost every Brit get dressed up and attempt to conquer their deepest fears come the end of October. Is it the pre-installed masochist in us that’s done this? Could very well be that. There’s only one thing we like more than biting our tongues: being humiliated. So Halloween most come naturally, right? Whilst that could very well be the case, it’s more likely that the characters on the big screen have done it. Since the mid-twentieth century Hollywood have gushed a plethora of distinctly scary villains our way. And to be honest, us Brits have loved it. We love watching them on the screen. We love dressing up as them. We love being not being terrified by them. We’re not terrified by them, are you? 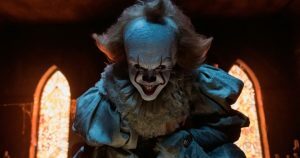 Ok, we’re terrified by them too..
Stephen King conjured Pennywise for his novel IT. To say the character struck a chord is an understatement. He terrified the whole of America! What do we think is the most spooky quality of Pennywise? His teeth – no doubt. Whilst we agree Pennywise is very scary, what gets to us most is his evidently bad oral hygiene. Not only does he live down a drain, it is transparent that the clown torturer doesn’t floss. That sends shivers down our spine. He could definitely do with a whole new set of teeth. Hannibal: The cannibal that frightened a generation. Looks like hannibal kept his gnashers in decent nick, perhaps because of- well, because he was eating humans. We assume that if you’re doing that your teeth would have to be in perfect condition. 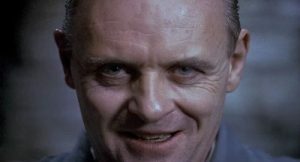 Perhaps in an alternate universe where our dental implant studio was stationed in Hannibal Lecter’s prison, he wouldn’t be due a visit to us. Which is good. We don’t think he’d be good at patient-dentist back and forth. He’d probably be a laconic pain. We wouldn’t want to put hands in his mouth anyhow. So bitey! 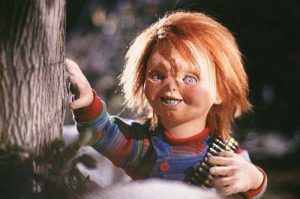 Chucky, the doll from Child’s Play: sardonically sadistic; spookily sinister. Chucky spooked the world when he entered the scene. How were his teeth I hear you desperately cry? Considering he was designed and made in a factory, you’d assume Chucky’s teeth would be some of the best. They were not. On the horror movie scale, they’re on around the same level as Hannibal’s; much better than Pennywise’s. That poor clown might have the worst in the industry. 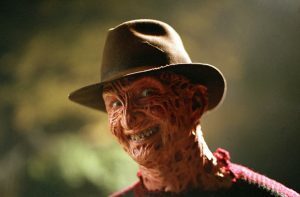 Freddy: one of the biggest villains in the industry. Since his inception, Freddy has mostly resided in any God-fearing person’s dreams, where he kills their subconscious self and – as his superpower dictates – their real self too. Simultaneously.But did you kno— yeah he has tremendously bad teeth too, ok. You get it. 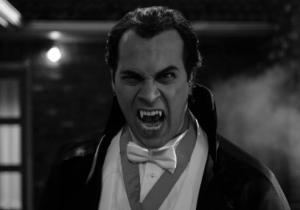 Count Dracula had immaculate pearly whites. Looks they had some fine dentists in Transylvania. Probably no dentists of the year, though. Halloween is usually full of sweets and spooks. While we’ll allow a suitable dosage of spooks (if you’re brave enough), sweets are a big NO from the Implant Studio! They ruin teeth, and we love teeth, so don’t ruin them! Why don’t you come in and meet us!